You didn’t think we’d talk about cocktail party recipes, like this and this, and not talk about empanadas, did you?! I wouldn’t leave you hanging like that! 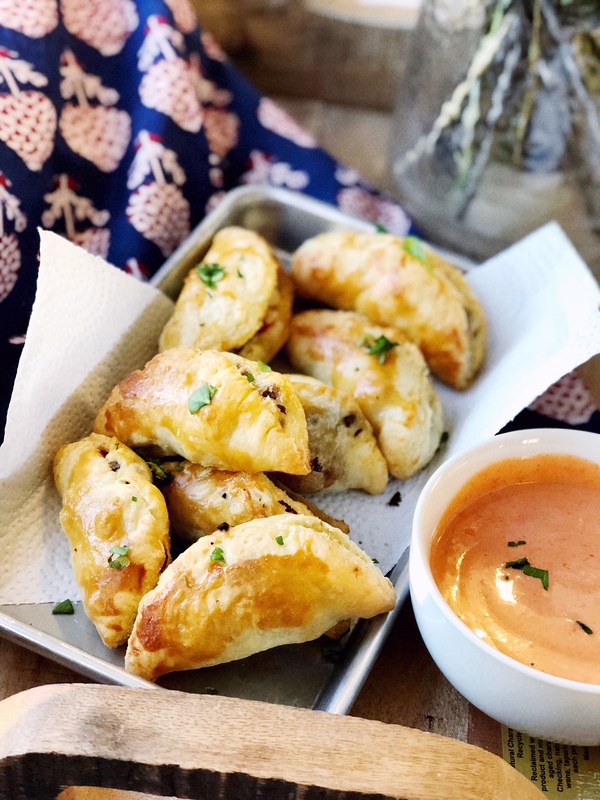 These empanadas have been crowd pleasers lately, especially with the aioli I shared with you in the chicken thigh tapas post! 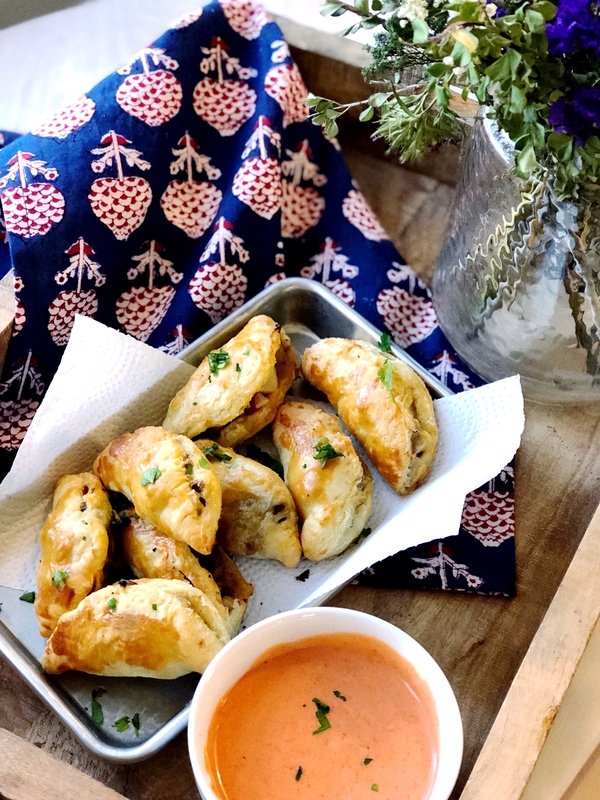 These empanadas use puff pastry as the shell, which give a lovely crunchy, buttery and almost sweetness to the empanadas. 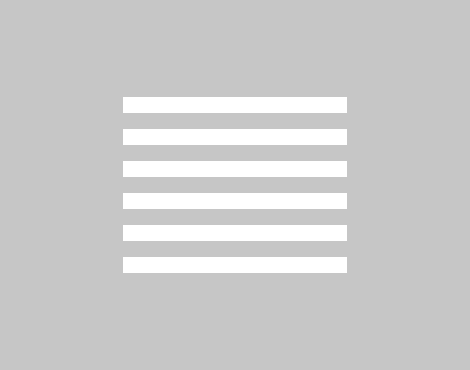 And there are 2 secret ingredients that make it interesting – keep reading! My favorite thing about these empanadas is that they are baked! No deep frying here, so they feel 1. A little healthier (only a little) and 2. A little easier. Once you’ve browned the beef, which can be made the day ahead, these come together pretty quickly. 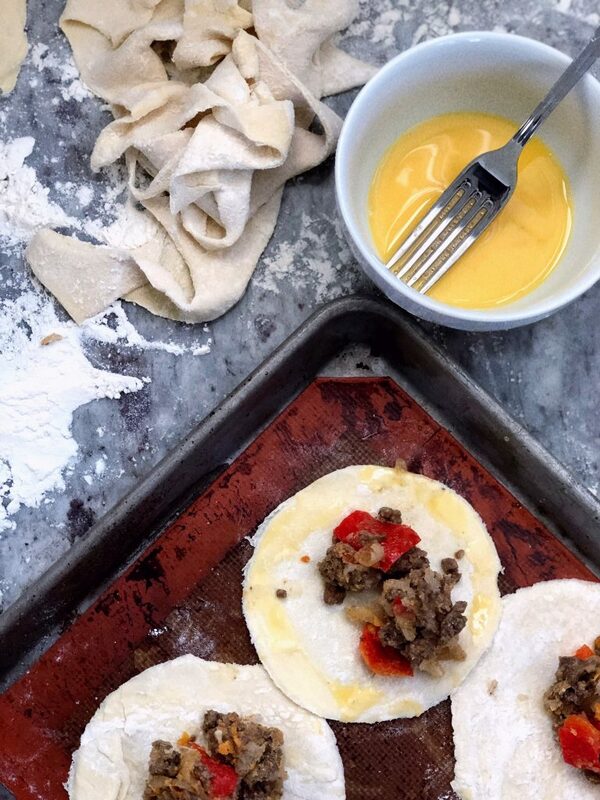 They are a little labor intensive, with some chilling time for both the filling and the dough, once you’ve formed the empanadas. This recipe also calls for dried cranberries and green olives. Don’t skip it! These two super secret ingredients really seal the deal on the whole irresistible thing. I have also made these as open empanadas, which hubby says are even better. Instead of folding up the empanadas, you place the shell in a muffin pan and put the filling in the center and just bake them up! Easy! 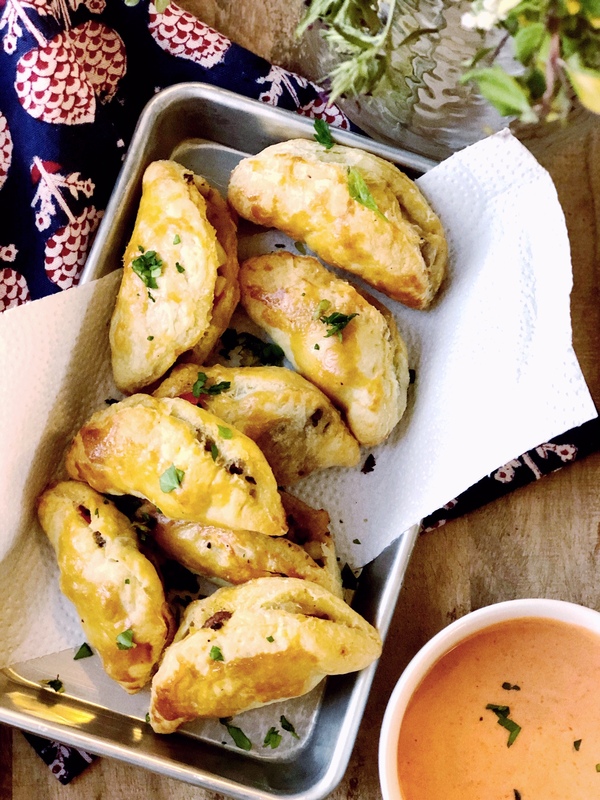 The cranberries and green olives in these baked empanadas really bring the dish full circle. Heat a sauté pan with 2 tbsp olive oil. Sauté onion and red pepper until soft, about 5-7 minutes. Add 2 tbsp of oil, and cook beef with spices until browned, about 10 more minutes. Allow mixture to cool completely. Meanwhile, roll out pastry on a floured surface. Using a large cookie cutter or a glass with a wide rim (about 3-4”), cut 24 rounds. Place 1 tbsp of mixture in the rounds and top with cranberries and olives. Using some water, draw a border around the edges of the dough to create a seal. Fold empanadas in half using a fork to finish the seal. Allow prepared empanadas to chill in the refrigerator for 30 minutes. Bake empanadas for 25-30 minutes.